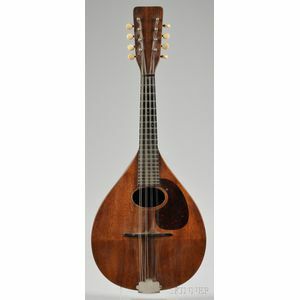 American Mandolin, C.F. Martin & Company, Nazareth, 1921, Style AK, serial number 9332, branded internally, length of back 12 in. Good. Slight surface scratches and abrasions. Finish fracture along center joint of back. String action 3/32" at 12th fret. Hairline fracture down length of fret board.